The TTR 110 is Yamaha's contribution to the 110 "pit bike". 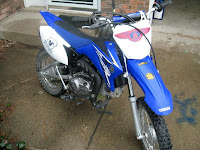 The first year of the TTR 110 is 2008, replacing the TTR 90. Our oldest boy has been very happy with his 2004 Suzuki DRZ 110 so when our second boy was in the market we made the decision to stick with the 110. They seem very reliable, easy to ride, and have gobs of good torque and HP for a bike of this size. Being listed at about $1,900 it is priced a little above the comparable KLX 110 and the DRZ 110, but look around and you will find them cheaper as we did. The extra money is justified, however with an electric start and an extra gear. The TTR is a 4-speed, auto-clutch as opposed to the 3 on the other 110's. The extra gear gives a very low 1st gear and a little higher top speed. It really seems like it doesn't need the extra gear since in 1st gear the bike is really jumpy and a little hard to control, especially for smaller riders, but it gives a nice range of usable gears to chose from. The electric start is supplemented by a back-up kick starter just in case. Having an electric start on this type of bike really makes sense since smaller riders won't have the weight necessary to kick start it. Currently you probably won't find a new bike any smaller than a 110cc for kids since anything under 110 is considered for kids under 12 and are banned from being sold right now because of the lead law. It worked out for us since we wanted the 110 and our child had already learned to ride, but this bike is really big for an Eight and under child and would be hard to learn on for a first bike. So far we really like this bike. Our boys both started on a 2-stroke KTM 50, and they both like the bigger 4-strokes better. It's a great in-between bike since it has an auto-clutch, requiring shifting, but not requiring the use of a clutch. One last note is that this bike has a higher seat height of most other 110's and having the electric starter adds about 15 pounds. I think the seat height has been more of an issue for us than the weight, but it didn't take too long for our son to get use to it. It doesn't feel heavier, at around 155 pounds, and the starter is tucked up well out of the way, but our 7-year-old can't pick it up off the ground yet. If you look close, you can see the broken brake lever from being dropped about a dozen times because our son is also not able to reach the ground...he can ride it like crazy though! Here's a link to more specs for the bike. It's listed at $1949, but expect to pay much less at the right dealer. Here are a few pics of the bike in action. Our son had no problem charging these hills in third gear, and the suspension felt as good as the racy KTM 50 to our son. 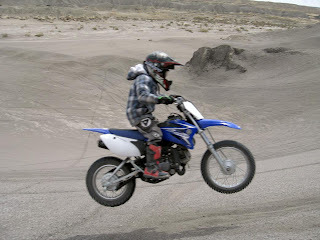 He was almost immediately jumping higher and going faster on this bike which was very surprising to us. Rad, cool bike! Better than an electric bike. I am glad Owen's got a bike to ride on and doing jumps. Really awesome, cool, studly, neat, slick, sick, bogus, excellent, yes way, high end kind of bike. Oh sorry, my bad. FAST! You should have seen Josh after he saw that monster on the tic tac toe game. He was so scared and went into his room and cried. But he did like the Magic 8 ball though. You're welcome, I think the 110 would be perfect for a 12-year old starting out, assuming he's not too tall. The TTR is electric start, but my 10 year old has no problem kicking over his DRZ110 to start it. Unless you absolutely need a new bike, I'd look for a good deal on a used KLX or DRZ...although the TTR is a taller bike that would tend to fit a taller rider better. I believe they make a "L" or large version of the klx however. Maybe so, perhaps I didn't realize how fast these kids grow. My oldest is 10. Thanks for the input! I'd say that a pretty fair price. I've seen them listed from $1200 to $1500.